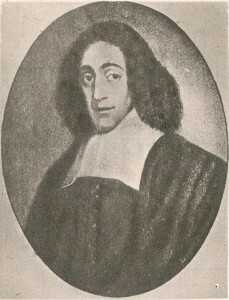 Portrait of Baruch Spinoza published in Plaatsjes-album vaderlandsche historie 2 (1926), via Wikimedia Commons. There is no such thing as politics without sovereignty. This claim, advanced most forcefully by Thomas Hobbes, has become axiomatic within dominant strands of Western political theory. In Leviathan, Hobbes denies that humans can achieve peaceful coexistence in the absence of a state. "For if we could suppose a great Multitude of men to consent in the observation of Justice, and other Lawes of Nature, without a common Power to keep them all in awe; we might as well suppose all Man-kind to do the same; and then there neither would be, nor need to be any Civill Government, or Common-wealth at all; because there would be Peace without subjection." When Hobbes predicates peace on subjection, he makes a particular structure of rule—namely a "common Power to keep them all in awe"—a political imperative. For a community to count as a polity or "commonwealth," Hobbes insists, it must submit to rule by an absolute sovereign. With the claim that absolute sovereignty is a condition of possibility for political community, Hobbes also makes territorial contiguity one of the commonwealth's defining traits. For Hobbes, a world government is a ludicrous supposition, a contradiction in terms. Because peace requires subjection, the world must be divided up into discrete, territorially bounded states. Moreover, these states exist in a state of war, because, on Hobbes's view, there is no law that transcends state borders (other than the impotent and unenforceable law of nature). In the tradition that Hobbes founds, the possibility of political community beneath, between, and beyond territorially bounded states is almost inconceivable. 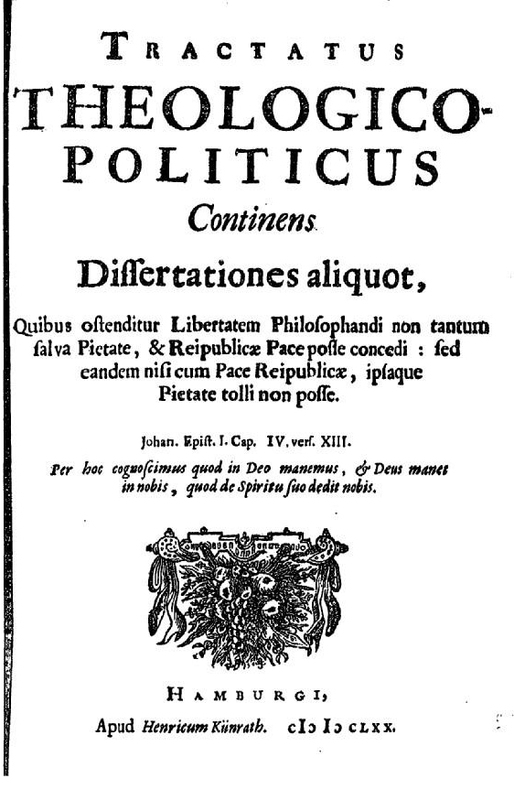 Title page of Baruch Spinoza’s Tractatus Theologico-Politicus (1693). Gallica, Bibliotheque nationale de France, gallica.bnf.fr. In the Theologico-Political Treatise, Hobbes's contemporary, Baruch Spinoza, famously draws out implications of Hobbes's definition of politics for modern Jews. If sovereignty is a sine qua non of politics— and, by extension, the territorially bounded state is the only recognized form of political community—then diasporic Jews do not count as a political community. (Nor do individual diasporic communities count as bona fide polities.) Significantly, Spinoza reaches this conclusion by telling a story about Hebrew political history, a story that reduces biblical religion to an instrument of statecraft. When Spinoza relates the history of the ancient Hebrew state, he depicts Moses as a savvy political leader who instituted what he calls "ceremonial observances" (e.g., kashrut, Shabbat, and holidays) to secure obedience. With this resolutely political interpretation of Hebrew religion, Spinoza releases modern Jews from halakhic obligation. The laws of the ancient Hebrew state mandated ceremonial observance, but, as that state no longer exists, observance cannot be obligatory for modern Jews. Spinoza concludes, "after the destruction of the city God demanded no special service of the Jews and sought nothing of them thereafter except the natural law by which all men are bound." When Spinoza lifts the yoke of halakhic obligation, he effectively discredits what one might call "Jewish"—as opposed to Hebrew, Israeli, or liberal—politics. By the term "Jewish politics," I mean traditions that retain a political conception of Jewish peoplehood while denying that a Jewish polity must take the form of a nation-state. In Spinoza's framework, the social and legal activity of the kahal, whose vibrancy is documented in Michael Walzer's Jewish Political Tradition anthologies, remains below the threshold of the political. Indeed, for Spinoza, what I am calling "Jewish politics" is an incoherent anachronism. On Spinoza's view, the rabbinic claim that Jews are bound by Halakhah—that is, by laws other than those of their states of residence—betrays a failure of political understanding. Having denied that diasporic Jewish communities count as political communities, Spinoza insists that there are only two viable political options for modern Jews: citizenship in a Jewish nation-state or neutral citizenship in a democratic republic. Spinoza explores the first option in a passage beloved by early Zionists. Comparing the Jews to the Chinese, who eventually regained political independence, Spinoza allows that, "were it not that the fundamental principles of their religion discourage manliness, I would not hesitate to believe that they [the Jews] will one day, given the opportunity—such is the malleability of human affairs—establish once more their independent state, and that God will again choose them." Spinoza defends the second option throughout the Theologico-Political Treatise, which hails democracy as "the most natural form of state." In a democratic republic that grants citizens freedom of thought and expression, individuals are free to practice Judaism, but, as Stephen Smith has argued, Judaism becomes a private identity (rather than a political membership or a binding legal obligation). Reading the Theologico-Political Treatise today, we may marvel at Spinoza's prescience—for the majority of contemporary Jews live under one of Spinoza's preferred political options. Yet if Spinoza appears prescient, the ascendance of his theoretical framework has not been without cost for Jewish political thought and practice. When Spinoza reiterates the Hobbesian dictum that there is no such thing as politics without sovereignty, he narrows the possibilities for Jewish self-understanding, withdrawing theoretical resources requisite for affirming what I have called "Jewish politics." After a tumultuous period that witnessed a proliferation of Jewish political movements and ideologies, we are arguably back where Spinoza began, at a moment when Jews appear to have only two political options: Liberalism or Zionism. Jewish political thought remains captive to an interpretive frame that makes these ideologies seem like the default, given modern Jewish history. Revisiting the Theologico-Political Treatise reminds us that these alternatives only seem obvious to us today because we interpret modern Jewish history through a particular (Spinozist) lens. Developed for polemical purposes, this lens originated with the rise of the nation-state system, and it made a particular kind of territorial sovereignty a political requirement. What does Spinoza's attack on rabbinic authority have to do with The Land? I have invoked the Theologico-Political Treatise to recall a different set of connotations that "the land" bears within Western political theory and Jewish political thought. Today, when we debate the political valence of The Land, we usually mean the Land of Israel. In these debates, the burning questions surround the nature and legitimacy of Jewish attachment to the ancestral homeland: Does the Land of Israel possess inherent sanctity? Is settling the Land of Israel a religious imperative? Must a Jewish state be located in Palestine, or can it be located in Uganda? Is the desire to feel "at home" politically redeeming, or politically suspect? Questions like these have a venerable lineage within Jewish political thought—and they remain urgent today. I would argue, however, that Jewish political thinkers need to move beyond a narrow preoccupation with The Land and think more broadly about the relationship of land to political community. In other words, we need to revisit assumptions about territorial sovereignty inherited from Hobbes and Spinoza. Although the parties to the Palestine/ Uganda debate adopt different stances with respect to the Land of Israel, they agree that "land"—that is, a territorially bounded state—is a political imperative. In our preoccupation with the status of The Land, we are liable to ignore a more fundamental theoretical question about land, a question made urgent by Jewish political history: Is political agency possible in dispersion? Given the Jews' history of dispersion, rethinking the relationship of land to political community is as critical a project as rethinking the centrality of the Land of Israel. Tackling the question of "the land" is a particularly pressing project, I would argue, for scholars who lament the hegemony of a state-centered Zionist ideology. Too often, self-styled diasporic thinkers devote their scholarly energies to loosening the hold of The Land on Jewish political imagination. For these critics of Israeli policy, the key task is to moderate Jewish attachments, sentimental or otherwise, to the Land of Israel. Thus, diasporic thinkers have celebrated homelessness and wandering; they have nurtured attachments to alternative homelands (e.g., Miami Beach); they have located the Jews' home in The Book; and they have deferred the desire for return onto a messianic future. Without denying the force of these projects, I would nevertheless argue that they neglect more fundamental questions about the relationship between sovereignty, territory, and political community. Political Zionism's appeal derives less from the rhetoric of return than from the claim that a territorially bounded state is a necessary counter to anti-Semitism and a necessary condition for self-determination. To contest these claims, and expand Jewish political horizons beyond the two options that Spinoza identified, we must undertake a more searching exploration of the possibilities that Jewish political history affords for theorizing political agency in dispersion. In other words, we must resist the assumption that political community is defined solely or primarily in geographical terms. Julie E. Cooper is senior lecturer in the Political Science Department at Tel Aviv University. She is the author of Secular Powers: Humility in Modern Political Thought (University of Chicago Press, 2013).